Aston Clinton Park is situated within Aston Clinton Aylesbury and is an active space for the local community. The Multi-Use Games Area was to be created alongside the existing local play area, providing more activities for all ages to enjoy. A site visit, risk assessment and health and safety report was conducted to allow Monster Play to provide Aston Clinton Parish Council with the best solution to meet their needs. 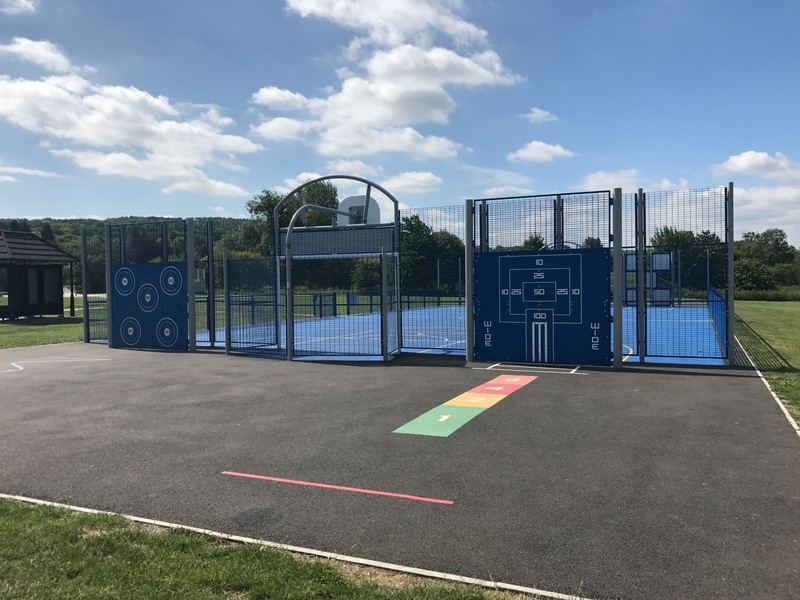 The Client indicated they wanted the Multi Use Games Area (MUGA) to provide opportunities for older children to play football and basketball alongside some added games features external to the MUGA. The site required fencing and surfacing, with a focus on brightly coloured Acrylic Coated Tarmac. 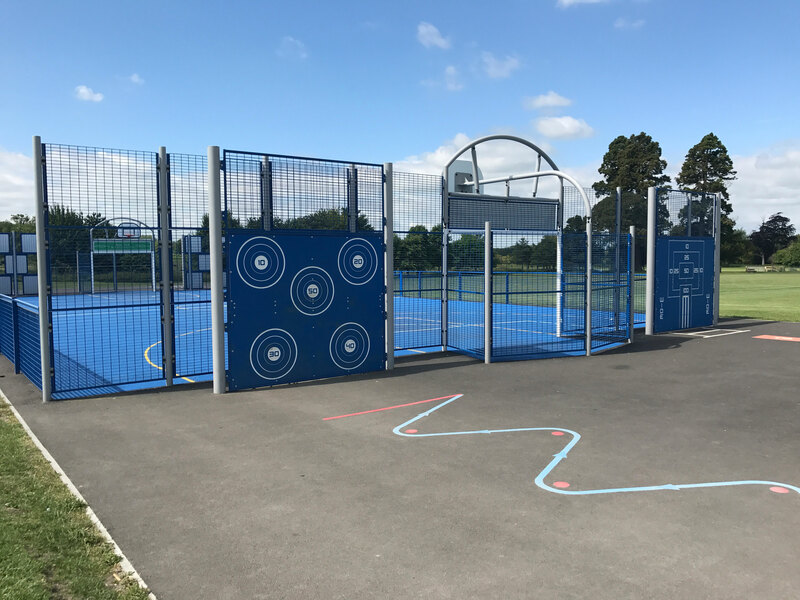 The MUGA in Aston Clinton Park, Buckinghamshire was installed in December 2015 by Caloo and their team of contractors. Aston Clinton Parish Council had been the recipient of a relatively large sum of Section 106 money, via their District Council. This is funding set aside from new housing, by the developer and must be put towards recreational facilities for the village. The parish council wanted to boost sports and games in the village, aiming provision specifically at young people and had prioritised the MUGA from this money. Caloo was chosen, following the usual 3 quotes procedure. 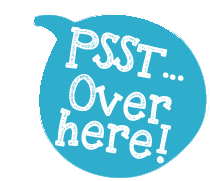 Having money enabled us to have the best rather than the cheapest, although a huge range is available from a variety of suppliers. “Caloo were in on our deliberations from the start with helpful but not pushy advice. They were aware we were undergoing a quoting process but when they laid out what they could supply, in the end it was obvious who the supplier should be. We decided on an Interactive MUGA with capabilities for football, cricket, challenge wall, knock out wall, 5-a-side and basketball. Now that it is installed, it feels like much more. We did wonder about a great big piece of steel in the park but now it feels like it has always been there. It is attractive, colourful and loaded with things to do. We were lucky we could afford the external games options as well as internal and these have stimulated all kinds of interesting play from the local children. The interior is very well-used. There are groups on it every day – all informal, and in fact the informality of it has led to more cooperation in the park, as the different age groups interact and make allowances for each other to play. The only structured groups using it have been junior football and Buggyfit (ladies exercising with their little ones in buggies). 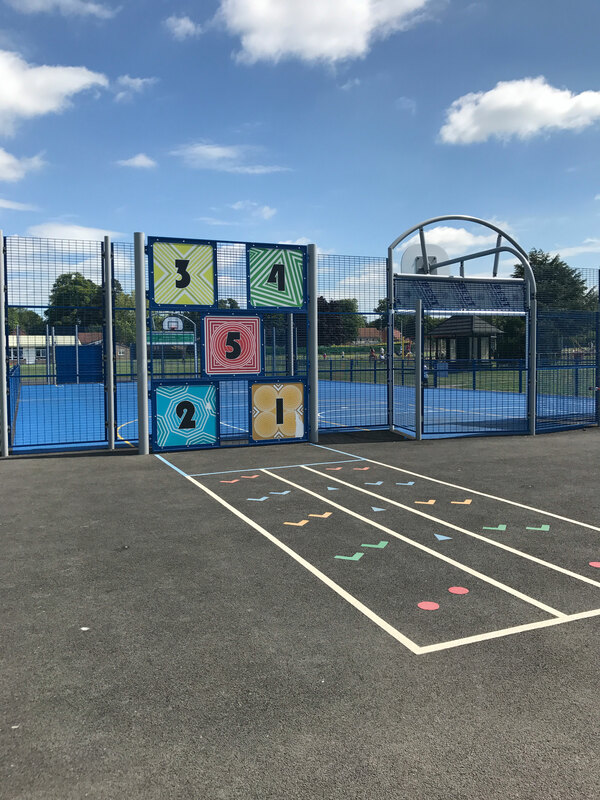 These activities do not book the MUGA as we have never felt the need to introduce a booking system, yet they never seem to clash with other groups wanting to use it. From the start Caloo were easy to work with, communicative and TIDY! they started when they said they would and finished within the timeframe. They have recently been back to paint-on the markings, which had to wait until drier weather, and this has stimulated even more play. 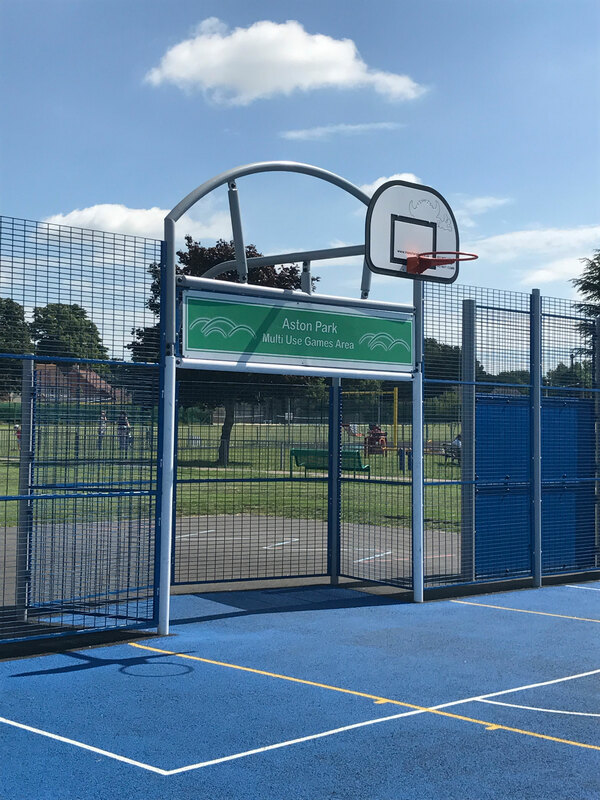 The MUGA is a very popular item in the park, sturdy and well-constructed but colourful and of a decent quality. The Client were looking to transform an existing playground with new colourful wet pour surfacing around existing kit. The Client were also looking for a large multiplay unit for all age groups to be installed alongside a new swing set. The Client tendered for an older year’s playground to be built alongside their existing infant area. The site was to be surfaced with Bonded Rubber Mulch with connecting pathways for easy access. The Client indicated they were looking for an outdoor gym bundle to be installed into their local recreation ground with surfacing. They were interested in the equipment being laid out to for a circuit for local users. The Client had an existing fenced of tarmac space which they were looking to develop into a fitness area. The Client was interested in goal ends and upon seeing the MultiActive panels were interested in taking the project further. The Client went out to tender for the installation of an outdoor gym facility at the York Avenue Site. They were looking for a variety of equipment for all abilities to use, to create a full body workout. The Client were interested in the Community Gym bundle in blue and silver with grass matting, this allows opportunity for cardiovascular and strength-based workouts to take place. Further play units were selected including swings, a zip line and a Wheelchair accessible trampoline. Allowing the site to be inclusive for all users. The new half pipe has provided a space for people to practice their skate techniques within the local park. The site has seen regular use and this has proved to be the ideal product choice for this location. The Client were looking to add an outdoor fitness destination to the community park. They were looking for a hard wearing surface which would be suitable for all users to access the gym. The Client requested a variety of strength and cardio based units which had options for multiple users to socialise while exercising. The Client was looking to build a sensory play space within their grounds. The existing site was a grass space which was prone to water build up during heavy rain. The client was looking for a drainable surface solution alongside musical playground units and a double bay swing. 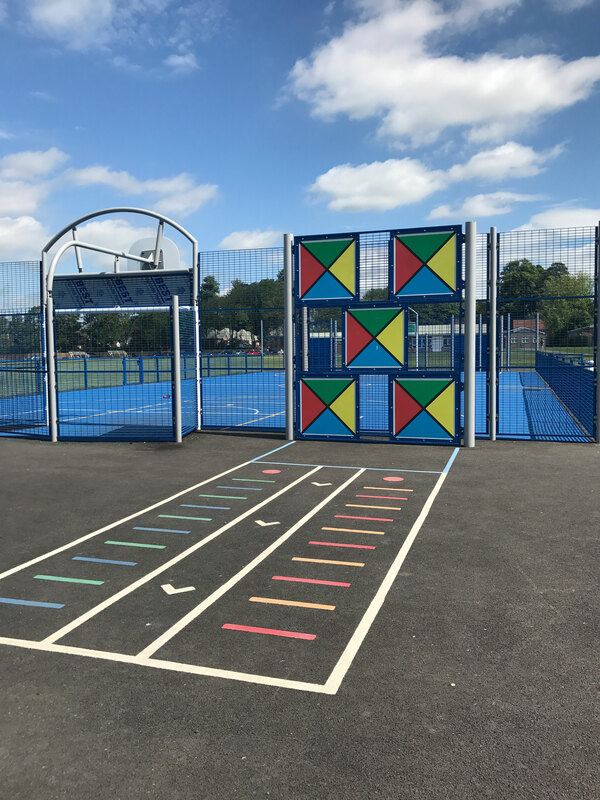 The Client were looking for an outdoor fitness zone for the children to use both as a recreation space and in PE lessons. A wheelchair in ground trampoline was also requested to provide a fun play option which is accessible for all users. Safety surfacing which is also wheelchair friendly was required.